Sarah Hanners is of a tender heart. But don’t mistake her gentleness for lack of tenacity. Whether leading anti-poaching patrols at night in Bolivia’s wildlands or combating deforestation in the Amazon rainforest or representing children and teens with foster care and immigration challenges at Miami Law, the 33-year-old has a fire inside her. After graduating from the University of Miami with a Bachelor of Science in communication and history in 2004, Hanners spent a year in Korea teaching English to elementary school students, before spending time backpacking around Mongolia. While traveling in the Gobi, she met a woman who raved about the lemon meringue pies in Bolivia. The following year, she tackled South America. On a trek from Argentina to Peru, she decided to take the road less traveled through Bolivia, rather than the usual route through Chile. In a last-minute and serendipitous decision, she decided to volunteer at Comunidad Inti Wara Yassi, Parque Ambue Ari, on the Beni River in eastern Bolivia, seven hours from Santa Cruz de la Sierra. The wildlife rescue center saves animals from traffickers, circuses, private owners who are mistreating them, and anywhere else harm is being inflicted on wild creatures. The group has three centers housing over 400 big cats, primates, monkeys, birds, and snakes. Since many of the animals cannot be released back into the wild because of the mistreatment they have suffered, they live out their lives in large enclosures, but spend their days walking with volunteers in the surrounding forests, for eight hours a day. At the outset, Hanners worked only with the animals, but worked her way up to volunteer coordinator and eventually to refuge administrator. She eventually became more involved in advocating for both the animals and the land. When a property dispute arose between the wildlife center and a neighboring Mennonite soy farm, Hanners witnessed first-hand how the legal system worked. In collaboration with an in-country attorney and the President of the organization, she petitioned the Bolivian government’s land reform agency to review the refuge’s boundaries and succeeded in the recovery. “That is when I realized that I couldn’t walk cats forever because there were bigger picture injustices that needed addressing, and I knew I needed a law degree to do so,” she says. Since coming to Miami Law, the Miami Scholar recipient has joined The University of Miami Inter-American Law Review, the Society of Bar and Gavel, the Student Animal Legal Defense Fund, and the Children and Youth Law Clinic. “One of the most satisfying/significant things I’ve done since coming to law school is founding the Bolivian Amazon Land Trust Alliance. I started this nonprofit in partnership with Comunidad Inti Wara Yassi and two of my peers from Bolivia, to combat deforestation through ecotourism and engaging in local outreach aimed at converting growers and ranchers to sustainable wild cacao farming,” she says. Professors quickly took notice when Hanners arrived at Miami Law. Hanners spent the summer of 2015 working in Texas at Wildlife Rescue & Rehabilitation, Inc., where she had the opportunity to work with attorneys from People for the Ethical Treatment of Animals and the Animal Defense Fund, coordinating with other agencies for the rehoming of animals and renewing permits with the U.S. Fish & Wildlife Service and the Texas Parks & Wildlife Department. 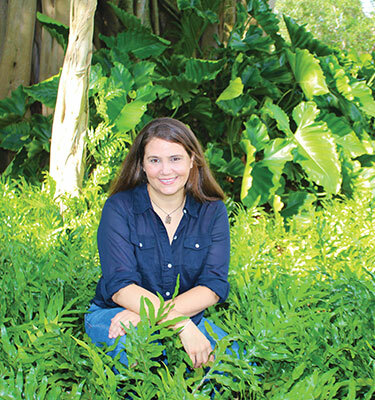 The Miami native spent the summer of 2014 at the Miami-Dade County Public Defender’s Office as an intern in the felony division and externed at the Everglades Law Center doing research on the effects of marine zoning on endangered species in the Florida Keys. This past summer she worked at Cet Law, Inc., a nonprofit founded by a Miami Law alumna, Natalie Barefoot, J.D. ’05. The group works in partnerships translating sound science into practical legal solutions that protect whales, dolphins, and porpoises as well as the oceans in which they live. Hanners’ work focused on researching the legal issues involved in the correlation between the decline in marine mammal health and port dredging. “My experiences at these placements have reinforced my dedication to advocate for the voiceless among us—whether they are an indigent client, an ocelot, or even an ancient tree—because the injustices they are facing are too big to fight alone,” she says. Hanners will be graduating in December 2016, always keeping a true hand on the tiller of her nonprofit, while she studies and takes the Bar. After that, the possibilities are limitless. She sees herself committed to a lifetime in the nonprofit environment, with forages into the forest with a wild animal or two by her side. Hanners has had many, many adventures since the trip to Mongolia and the first mention of the Bolivian lemon meringue pie. Ironically, she completely forgot to try a slice when in-country.